Includes electronic filing (E-File) via IRS AIR User Interface (ISS-UI) Channel. 1095-B forms can be keyed in or imported from text files and spreadsheets. 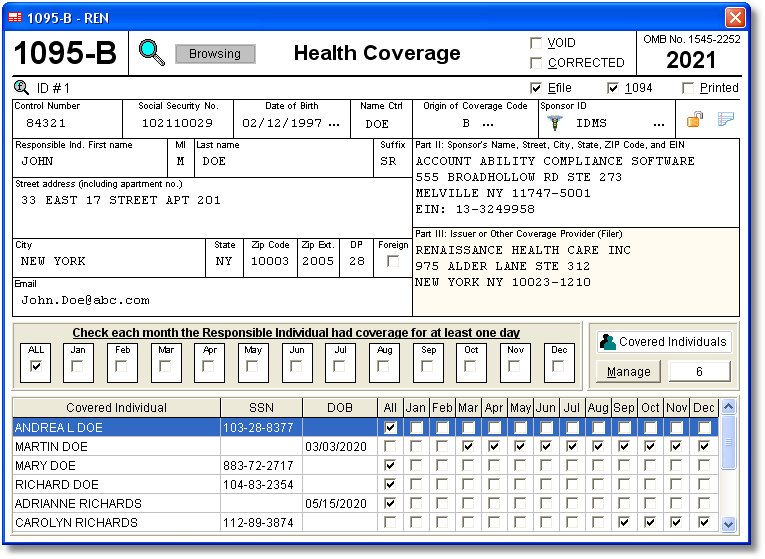 1095-B forms are easily maintained on user friendly windows resembling the actual IRS form (as shown above). Employers sponsoring coverage are maintained in a Sponsor database that is shared among insurance providers. Integrated Sponsor Management allows for easy maintenance and importing of employers sponsoring coverage. The Sponsor database is shared among policyholders enrolled in SHOP or Employer-Sponsored coverage. Complies with Section 6055 of the Internal Revenue Code. Creates XML transmittals and manifests (Originals, Corrections, Replacements) that comply with IRS Pubs. 5165, 5258. Five simple steps to creating, manifesting, and submitting ACA 1094, 1095 transmital files. The Manifest Management and Testing Module manages all ACA transmittals from a shared consolidated database. Includes complete comprehensive electronic and plain paper correction processing. Prints IRS copies on pre-printed landscape laser forms (for plain paper filers). Prints Issuer and Responsible Individual (Policyholder) copies on blank paper (see SAMPLE OUTPUT below). Exports 1095-B forms to CSV text files compatible with Excel. 1095-B forms can be rolled foward from year-to-year at your option. Supports an unlimited number of Coverage Providers (Issuers), Responsible Individuals, and Covered Individuals. Two levels of password protection to secure your returns. Forms can be locked for review only after final submission to IRS. Prints and electronically files transmittal 1094-B. Displays IRS 1095-B reporting instructions and filing due dates. Policyholder comments, visible only to the filer, can be added to any 1095-B return. Policyholder copies can be delivered via Account Ability's optional Print and Mail Service. All of your 1095-B forms reside on your computer (or network), not ours. Account Ability includes free and unlimited technical support to all licensed users. Visit our website and read all of the features. Reviews posted by users of Account Ability. More screen shots and sample output. Download the free trial version of Account Ability. Order your copy of Account Ability. Shop for 1095-B forms and envelopes. Visit Account Ability on facebook. Follow Account Ability on Twitter.